KERS is a miserable failure, that was made abundantly clear in China where all teams that removed it were relatively faster than they had been in Malaysia. Diffusers aside it seems that weight distribution may be more effective than KERS, no wonder all the major teams are furious at the FIA for forcing them to use it while at the same time giving a fee pass to the smarty pant diffuser crowd.... but that's about politics and for another post. This week end so far showed precisely why champions matter and why teams need that ultimate performance component if they hope to win. 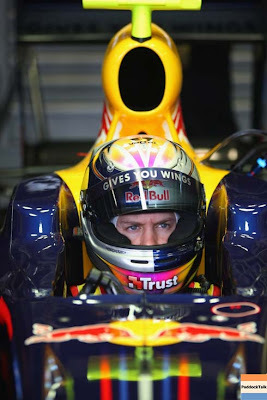 Sebastian Vettel had one shot at pole. There were mechanical issues and he is very light on fuel which meant he had only one flying lap each session including the final Q3. In Q3, he had just the warm up lap to get used to the new fuel load. His lap, which you can see below, was absolutely perfect. He's light on fuel along with Alonso and Webber but he delivered in a crunch the way only great champions are able to. Why BMW let this kid slip through their fingers I'll never understand. Fernando Alonso got a new diffuser on the car just this morning and while the lightest of the top 5 he managed once again to make the best with what he had and get on the front row. Impressive. The Red Bull and Renault strategy will depend on them making the most out of the soft tires which have been problematic over more than a couple of laps. Keep an eye on who starts on which tire. Mclaren and Ferrari are both very heavy with fuel but Raikkonen and Hamilton left their teammates way behind. Massa because he made a mistake on his final Q2 lap, Kovalainen likely because he does not have anywhere near the same car as Hamilton this week end. I think at this point poor Heikki can kiss his career goodbye. His only hope may be a move and a stroke of luck similar to Button's and Barrichello's. 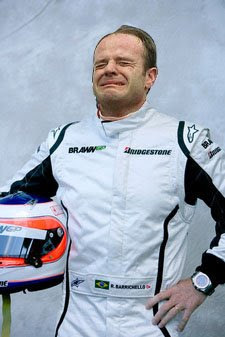 Speaking of Barrichello, he's been crying again, feeling like he can't get respect... His latest beef with Flavio Briatore who, jokingly referred to the Brazilian as a "pensioner" and Button as a "rolling speed bump". Rubens got all outraged and shot back calling Briatore "a stupid man". Well Rubens, I hate to tell you but... that's just the facts, if it wasn't for Brawn, you were going to retire and Button was certainly a rolling chicane last year with that Honda. Sheesh, some people just never know when to keep quiet and enjoy their luck! Im not sure if you guys will be able to see it, but there is a fairly good video on the BBC website with Mike Gascoyne (ex Force India iirc) explaining more about the diffuser differences and actually pointing out the crash structures which i hadn't seen elsewhere. Worth a watch if you can. BRAWN GP all the way! !